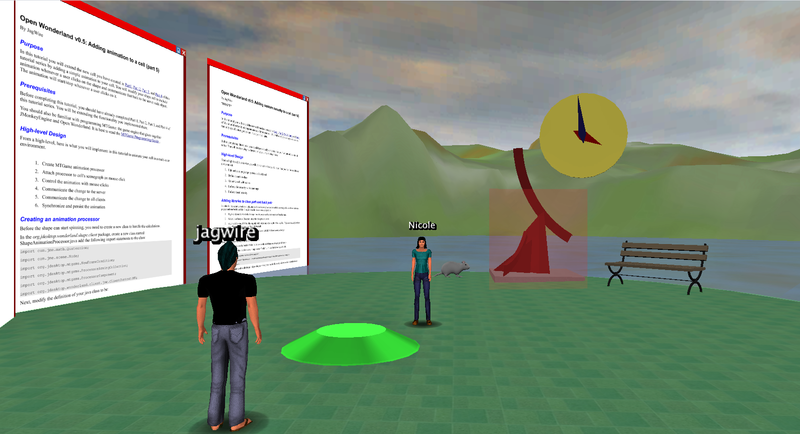 Wonderland Wednesdays are weekly, developer-focused sessions that take place in the Wonderland community virtual world. Please refer to the Events tab on the Open Wonderland Facebook page for details. This week’s Wonderland Wednesday will be on the topic of Subsnapshots. RSVPs are appreciated. Since its inception in March, Wonderland Wednesdays have provided developers in the Open Wonderland community with the opportunity to meet live with other developers to both learn about Open Wonderland and get to know each other. On Wednesday, June 23rd Open Wonderland developers were given the opportunity to showcase their work to the rest of the community for the first time. Of those developing in Wonderland, Jonathan Kaplan, Morris Ford, and myself attended on Wednesday to show the community what we have been working on. First to present was Morris with his work on integrating scripting into Open Wonderland, specifically with animating models created using Autodesk Maya. He first showed a clock with movable hands which kept real time by receiving data from an outside source. Morris then provided to the community an animated bug moving through the world while flapping its wings. Next up to present was Jonathan Kaplan. Jonathan has been working on a tool for Computer Science students. Students can experiment with writing sorting algorithms in the multi-user code editor, or instructors can insert code for different sorting algorithms in order to show students visualizations of the various algorithms. The visualization involves a grid of spheres of different shades that are sorted from darkest to lightest. The first algorithm he showed was Bubble Sort, which is a slow but easy-to-understand algorithm for students beginning computer science studies. While that demonstration was working, another instance of the same module was used to display Quicksort, a much faster algorithm than Bubble Sort. Showing the two visualizations side-by-side, one is quickly able to deduce that Quicksort is substantially faster than Bubble Sort. Quicksort on the left, Bubble Sort on the right. 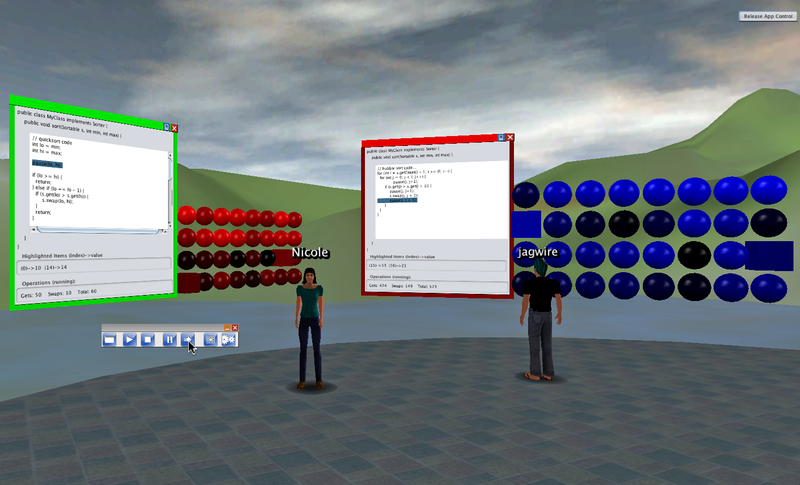 Students use the control panel to run the program or step through it one instruction at a time. 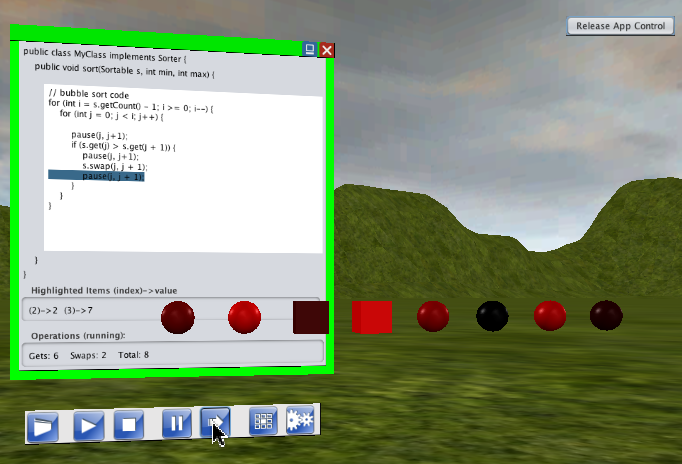 The line of code being executed is highlighted in the code window while cubes highlight the spheres currently being inspected or swapped. The Sort Settings window allows students to change the number of items being sorted, randomize the grid, and change several visual attributes. I was the final presenter. I first showed two new tutorials I have been working on. 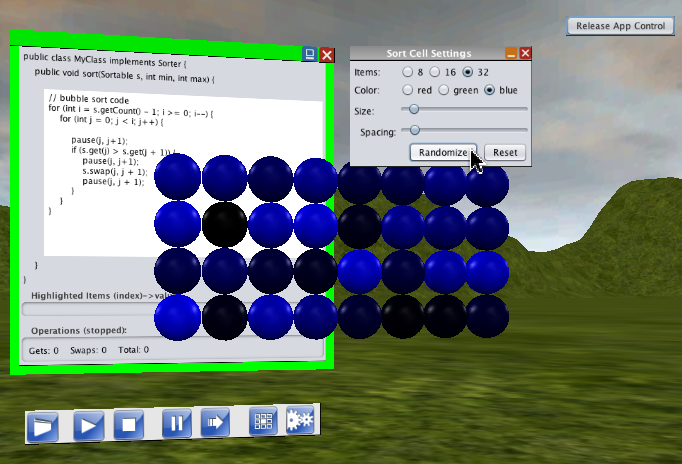 The first tutorial acts as a supplement to Jordan Slott’s “Developing a new cell” tutorial series. My first tutorial aims to add a simple spinning animation to the previously created cell. 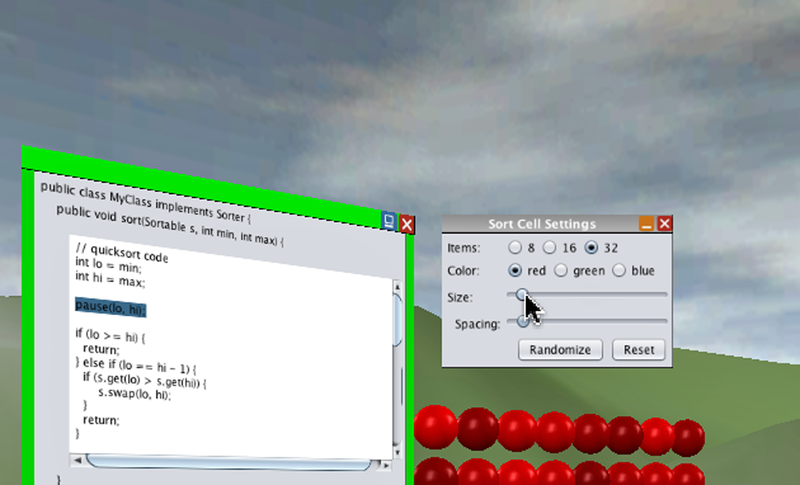 The second tutorial continues where the first leaves off and describes how to add security to the cell. With the two tutorials, I also presented a custom ContentImporter implementation for PDFs. 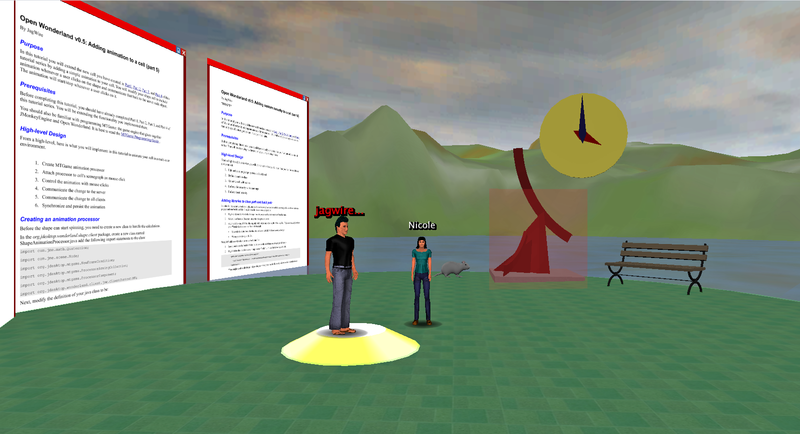 The content importer acts as a way to submit files to the content repository running on Wonderland servers without creating anything to be shown in-world. 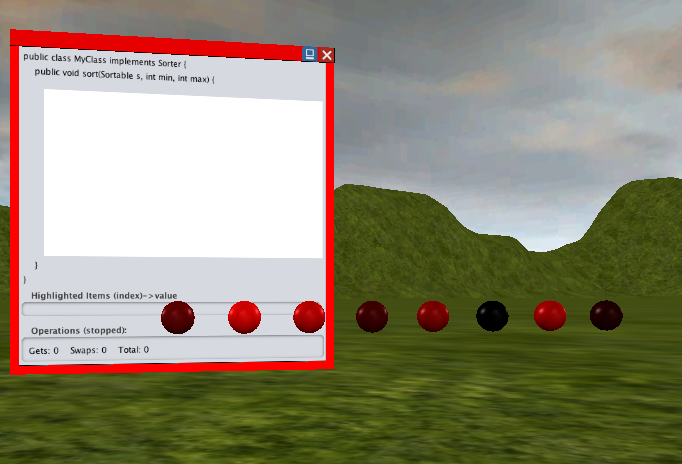 Next, I showed an Inventory module which allows Wonderland users to add in-world objects to a virtual inventory. 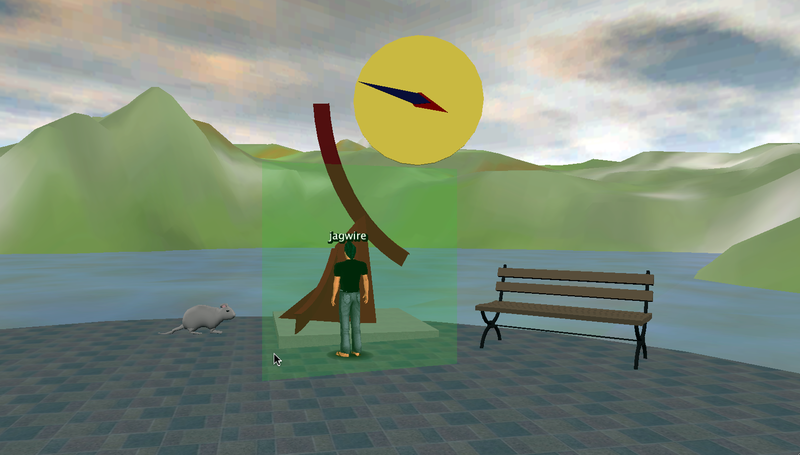 Users add objects to the inventory by clicking on objects which have an Inventory Component attached and choosing “take it” or “leave it for now” from a menu that pops up. After clicking "Take It", the red sculpture disappears from the world and reappears inside the inventory window. 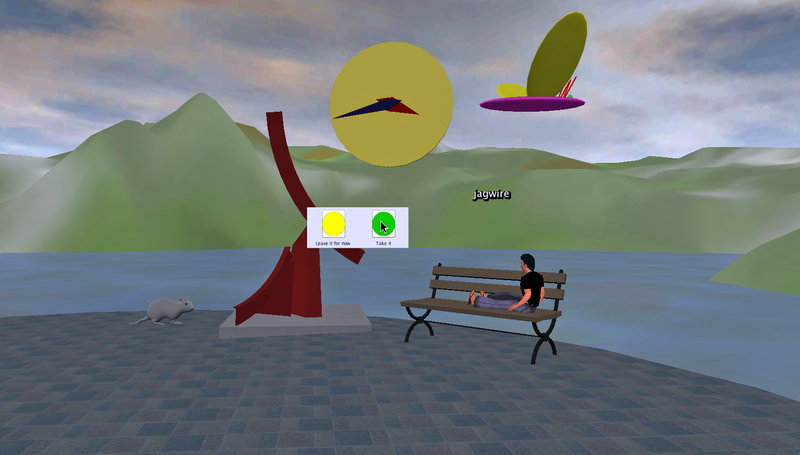 Clicking the remove button will make the red sculpture leave the inventory and reappear in-world. 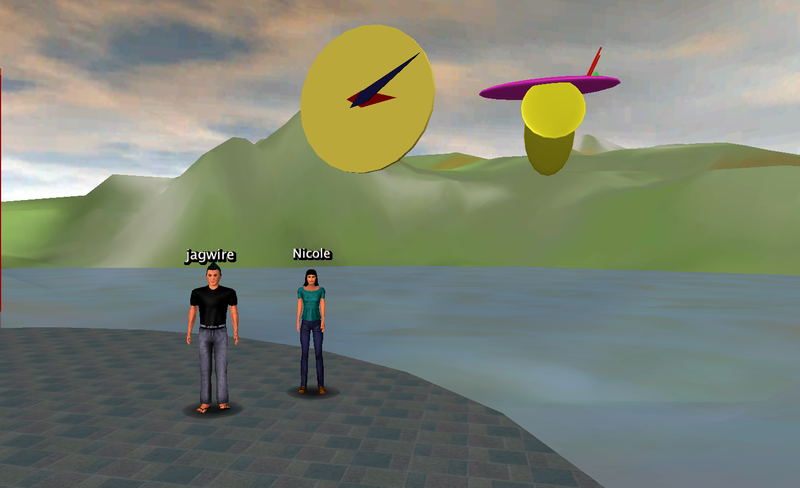 After presenting the virtual inventory, I show the “spatial affordances” that I developed for the iSocial project. (Editors Note: The term “affordance” is used in relation to Wonderland in a variety of contexts. If you are unfamiliar with the term, the essay Affordances and Design by Don Norman provides a detailed explanation of the term.) The spatial affordances act as ways to either keep users in a designated space, or keep users out of other spaces. The affordances are displayed as discs appearing on the ground to keep users within and red vertical squares which act as Force Fields. 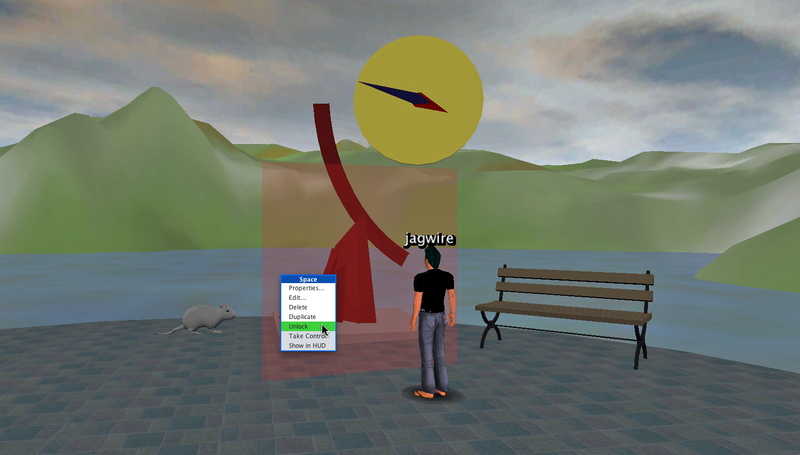 A red Force Field is blocking access to the red sculpture and the mouse. 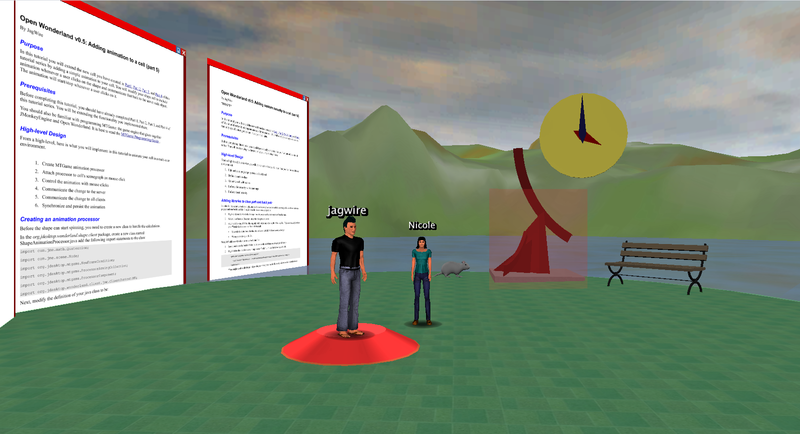 Selecting "unlock" from the context menu allows your avatar to walk through the Force Field. Personal Pods, which denote places for users to stand, are another type of spatial affordance. Personal Pods (pedestal shown in green) denote areas for which a person should sit/stand similar to a chair or desk. When a user stands on a Personal Pod, it turns red to show that the user cannot move outside of the bounds of the Pod. It also shows that no one else can occupy that Pod. Right clicking and selecting "unlock" from the context menu turns the Pod yellow while in transition to green. Once the Pod turns green, the user is free to move from the Pod. With the Pod green and the user no longer occupying the Pod space, another user can walk onto the Pod. This first showcase was a great success and everyone in attendance was excited to see what other developers were doing with the Open Wonderland toolkit. We hope this will be the first in a series, so please let me know if you have a module you would like to demonstrate so I can set up the next community showcase session.